On Thursday and Friday, we ran an educative workshop on apples for local primary schools, as part of their extra-curricular activities. It included a compote tasting session, designed as a formative sensory experience. 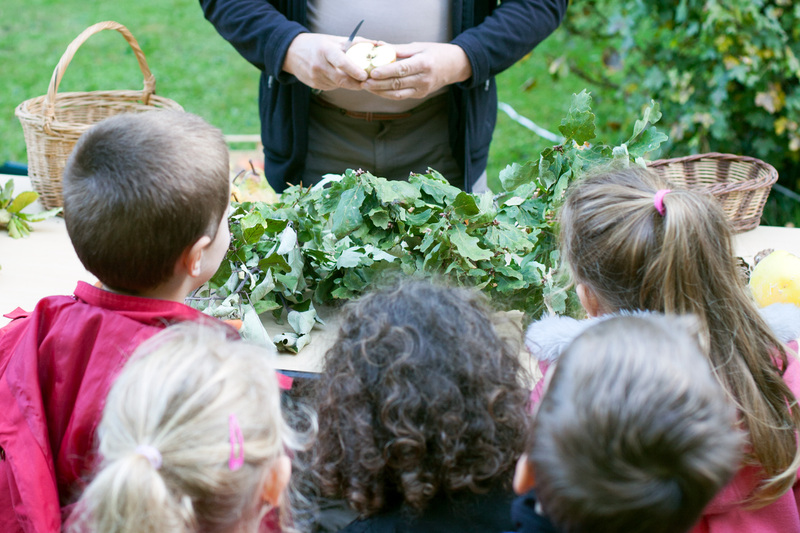 The schools had booked in advance for a one-hour workshop on the theme of apples, one of the activities proposed by the centre for education to the environment La Plantelière1 for its annual fair, a four-day event I would describe as “a celebration of life in harmony with nature”. ‘La Plantelière’s fair’. Source: https://www.caba.fr/planteliere/ (accessed 30 September 2017). 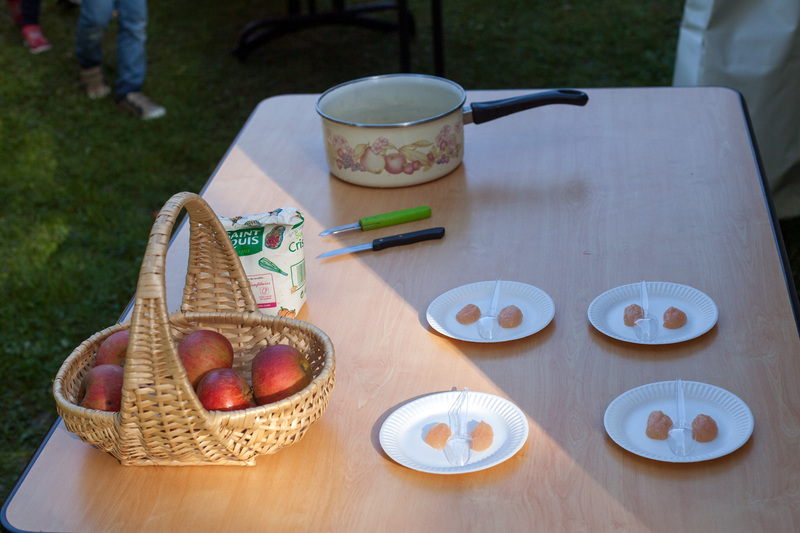 We, three volunteers from Les Croqueurs de Pommes du Cantal2, showed fruit and tree branches on which they grow, juiced apples and cooked compote for classes of eight to twenty-four pupils from 3 to 10 years old schoolchildren. With such simple ingredients like apples, sugar (optional) and a little bit of water, compote3 is one of the simplest dishes that can be used to teach children about cooking. And with just ten minutes needed to cook it on a small electric device, the result can be cooled down and tasted within the hour dedicated to the workshop. I had prepared compote in advance with the aim of contributing to the development of the children’s sense of taste. I had found information about food education for 3/5 years children on the Internet and figured out what could be done to make them understand what taste is about. I designed my animation so that they could both understand and experience taste. Each of the pupils was given a small plate with two samples of compote made with the same apples. Colour and texture were almost identical. I had worked to that aim the day before when preparing the compotes. They also had the consistency of a compote you can buy in the trade, so that the product would be familiar to many of the children. The only significant difference? One was sweetened and the other unsweetened. Just before the workshop, I asked the teacher whether the children already knew about the sense of taste. He said that some of them did, and that some others were supposed to learn about it in the coming fortnight, during “La Semaine du Goût”4 (literally “The Week of Taste”, an annual food education event organised in France since 1990 and in Japan since 2013). We agreed that my tasting experiment would be aimed at learning whether they can feel a difference in taste between the two compotes, which would form a useful introduction to the subject. Later on, they would talk about this experience in class and move to the next stage, starting to learn how to recognise the four main tastes: sweet, salted, acidic and bitter. We discussed what is a mouth for: talking, singing, eating… and… « How do you know whether you like what you eat or not? », « How can you make the difference? ». « Taste » was suggested by a pupil… « So the mouth is also for tasting… ». « Shall we taste the compote now? » « Yeahhh!!! » did they cheer, all in one hearty voice. We looked at the compotes, before tasting them together. « Do they look different? » Some children said they were the same, some others found differences. One said that one was slightly greener than the other. In reality, as I mentioned above, the compotes were almost identical. However, maybe the sweetened one was slightly more shiny than the other one, and it could have mirrored the green of the trees around, as the animation was carried out outdoors. Of course we didn’t go into these considerations, at this age, and accepted the principle that one could see a slight difference. Looking at the children tasting the compotes was very interesting. Most of them were putting a very small amount of compote on the spoon. Some didn’t spontaneously try one after the other to compare. So they learnt to do it. I told myself that this group of children would learn well about more complex aspects of taste and would soon be able to appreciate differences and judge what they prefer and why. Now, thinking about it, I can see how powerful education can be when it is geared towards the fundamental needs of children, in that case eating. One other interesting element was that within the first group of 24 pupils on Thursday morning, around a third preferred the unsweetened compote. One talked about light-in-sugar baby compote. Another said that his mother was not adding sugar to her homemade compote. On Friday, we carried out the same experiment and more pupils preferred the sweetened compote. It was partly because, I think, the compotes were made with some unripe apples and was even sharper than Thursday’s ones. Overall, it appeared to me that the children were very good at feeling, and in many cases at evaluating differences in taste. Unfortunately I have no picture of the compote making and tasting action, as I was running the workshop and it would have been a long process to get some of the pictures the teachers took to use them in their classes. However, here are the small plates with the two samples. Photo 29 September, La Plantelière, Aurillac, France. Here is a picture I took of my colleague showing what an apple is made of just before the beginning of the compote workshop. Some of the children were then able to articulate what should be done to make the compote, while I was prompting action with a knife and an apple in my hands: remove the skin, remove the core, cut the flesh… The two parts of the animation proved to be effectively complementary. Photo 29 September. The workshop didn’t end there. The compote we made on the day was not passed through a sieve. Morsels were still there. I offered the pupils to do a second tasting, to see whether there was a difference between this compote and the first ones, which had been pureed. They very much enjoyed the compote we made together. They found it smelled good when cooking and tasted great. However, they were not as acute at figuring out the difference in texture as they were with the difference in taste between the first two samples. Was it because sweetness is easier to feel for them than texture? Or did they like so much the experiment of cooking together that they preferred what they had contributed to make? I don’t have the answer, but I am sure most of them will have talked about the experiment in their families when back home. This entry was posted in Fruit for sustainable development and tagged Apples, Aurillac, CroqueursDePommes, France by Les Jardins d'ici. Bookmark the permalink.